America Japan Society held January Dialogue Program “Future of U.S-Japan Relations” on January 29th at the conference room of White & Case LLP. We welcomed Mr. Joseph M. Young, Deputy Chief of Mission from the U.S. Embassy and Mr. Ichiro Fujisaki, President of the America Japan Society moderated the dialogue. 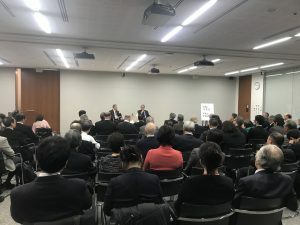 Mr. Fujisaki casted three questions respectively on North Korea, China and US-Japan relations especially about Trade Agreement on Goods, and Mr. Young elaborated on these topics. In Q&A session with participants, Mr. Young kindly responded to a dozen number of questions from international relations on Russia-Japan relations to the U.S. internal politics and public diplomacy. It was impressive that Mr. Young emphasized the importance of the cooperation between the U.S. and Japan in a wide range of issues. Amid the current complex international affairs, where all spheres of relationships such as politics, economy and culture are connected, the development of the amicable U.S.-Japan relations must be indispensable.